Have you ever experienced a power bill that costs a fortune? Do you live in an area where staying cool is a necessity? Are you someone that prefers to look into environmentally friendly options whenever possible? Then evaporative coolers are the right choice for you! Evaporative coolers, also known as swamp coolers, use the power of evaporation to keep air temperatures cool. They are great for cooling indoor spaces without paying an arm and a leg with your electric bill every month. California is the perfect low relative humidity area for evaporative coolers, which is why more and more Californians are turning to Aace’s Heating, Air Conditioning & Swamp Coolers for their expert-level swamp cooler service. Aace’s Heating, Air Conditioning & Swamp Coolers brings over 25 years of experience to every one of our jobs. 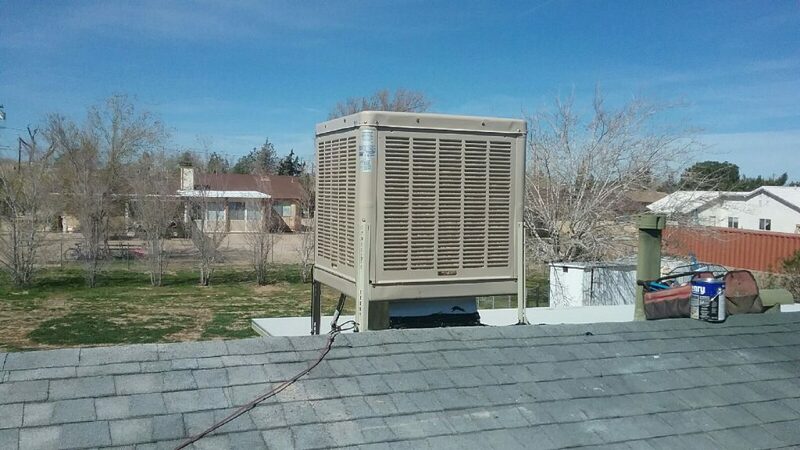 We put our customers first and want to ensure that any inconveniences you have with your evaporative coolers are resolved as soon as possible. Living without cool air on our property is something that can really disrupt and negatively affect our lives. Getting evaporative coolers fully functional in as little time as possible is the Aace’s guarantee. We offer swamp cooler service, evaporative cooler replacement, evaporative cooler repair, and more to help you chill out at home. Cool air is a must, especially during the summer time. That’s why having your evaporative cooler in good working order at all times is absolutely crucial! We spend a lot of time in our homes, so it makes sense that we want to be in a comfortable environment. If we can’t control the temperature within our homes, we start to panic. That’s why having a great swamp cooler service provider available to help out when you need it the most is so important. Aace’s Heating, Air Conditioning & Swamp Coolers can provide you with evaporative cooler repair service to get you back to living life to the fullest while you are at home. Swamp coolers are much more affordable than traditional air conditioning systems, are more environmentally friendly, and save you a ton of money on your electric bills. They make a lot of sense if you live in a region that is suited for them, like the West. If you can save money and help with conserving the environment by going with a swamp cooler, why wouldn’t you look into it? Swamp cooler service is necessary to make sure you are ready for the heat. Regular maintenance for evaporative coolers can help you prolong their lifespan and maximize their cooling potential. Aace’s Heating, Air Conditioning & Swamp Coolers is familiar with all makes and models of evaporative coolers and can help you with repairs, service, and maintenance. It doesn’t matter if you are a homeowner with only one swamp cooler or a business owner with several, Aace’s Heating, Air Conditioning, and Swamp Coolers can provide the swamp cooler service you need to keep the inside of your property consistently cool and refreshing. Don’t let a broken swamp cooler stress you out. Give us a call today for all of your swamp cooler service needs!